One of the greatest inspirations behind the Shimansky brand is creating symbols of everlasting love and commitment that will be worn for a lifetime. An engagement ring is the most meaningful gift a man will give and a woman will receive, and being part of finding the perfect ring is one of the most rewarding aspects of being in the jewellery industry. We were once again reminded of this truth when we recently witnessed a romantic proposal between a couple from Germany, inside the Shimansky Clock Tower Showroom. Their story all started with a unique birthday gift, given to Kerstin by her partner Torsten, a week prior to their trip to Cape Town. He presented her with a travel bag containing many hidden treasures. Upon opening the bag, was a gift, and inside that bag, was another bag containing another gift. The second last bag contained an air ticket to Cape Town and the final bag contained a Shimansky brochure with an image of the Evolym diamond ring. Kerstin’s face filled with sheer joy as she realised her birthday gift was to travel to Cape Town in South Africa to collect an Evolym diamond ring. With Kerstin under the impression the ring would be a birthday gift, Torsten contacted us to inform us that it would in fact be a surprise marriage proposal. When the big day arrived, we chilled the champagne, got the camera ready and were prepared and waiting to capture the precious moment when Torsten got down on one knee and confessed his love for Kerstin. 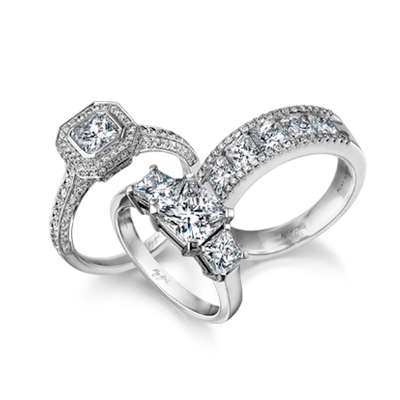 The Evolym ring looked magnificent on her finger, and is a unique creation from Shimansky that has the appearance of a delicately set solitaire diamond yet is firmly secured between three bands. It was a truly magical moment, one which we feel very privileged to have been a part of. From everyone at Shimansky, we’d like to wish Torsten and Kerstin all the best as they enter into the journey of life together.